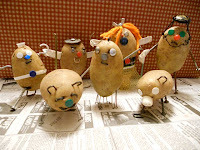 Glasgow Local Food Network: One potato, two potatoes, three potatoes, four! One potato, two potatoes, three potatoes, four! Bring along your saved seed or any surplus packets from last year and pick up some tasty new seeds for this year, including some heritage varieties, and get your hand's on this year’s seed potatoes! The event will provide people with an opportunity to choose from over 36 varieties of seed potatoes either as single tubers or larger amounts (the list of potatoes that will be available for sale is now on the GAF website). And you can also participate in a range of workshops and get information on growing potatoes and other useful growing tips and advice. There will also be refreshments and home made cake and plenty of time to share top tips on growing with fellow growers from across the city. 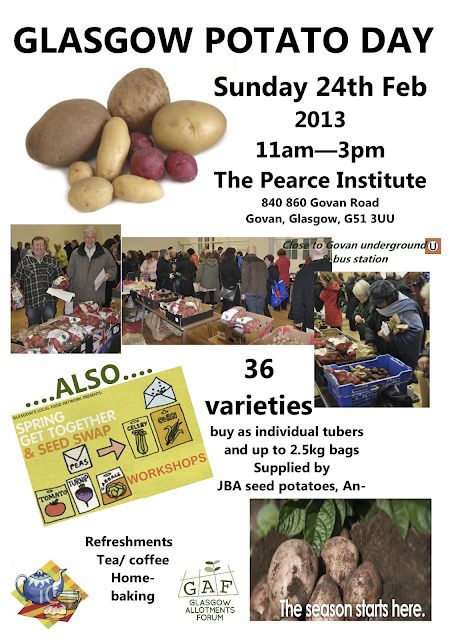 The event will take place at The Pearce Institute in Govan on Sunday 24 February and will run from 11am to 3pm. "An introduction to seed saving, looking quickly at pollination, a game on plant families, and a practical activity saving seeds. If you have any seed saving skills you'd like to share, or questions, please bring them along." 2.15 to 3.00 - Lasagna Gardening for Pots to Large Gardens - Minimum Effort for Maximum Yields with Luci Ransome from Permaculture Scotland. “We will explore Lasagna Gardening's practical "no dig" approach in transforming how you grow the seeds and potatoes you have collected today. There will be a practical demonstration, an interactive game and sharing of ideas. If you already Lasagna Garden please come along and tell us what works well for you!